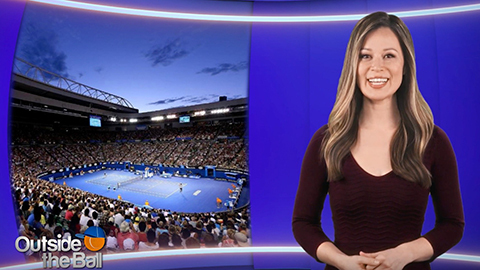 This week we took our continuing Web Series down under and joined your favorite tennis stars before the Australian Open. Grab a snack of Vegemite because Aussie natives Bernard Tomic, Sam Groth and Thanasi Kokkinakis kick things off! Later, host Mayleen Ramey catches up with former Australian Open champions Novak Djokovic, Angelique Kerber, Jamie Murray & his double’s partner Bruno Soares. From the tennis court to the basketball court, Bernard Tomic showcased his athleticism and sense of humor when he and Ramey played a fun game of hoops. The two tried their best to outdo one another with their own unique style, but Tomic stole the show when the tennis pro pranced around impersonating Ramey’s run, which Mayleen claims was exaggerated! Tennis has become a healthy addiction for many, but Sam Groth revealed he has a toe tapping addiction of his own. With a bag full of tennis shoes and Air Jordans, Groth doesn’t go anywhere without a collection of shoes. How many shoes does Sam have in his suitcase? “Maybe ten or twelve pairs.” Sam isn’t the only Australian with a keen sense of fashion. Thanasi Kokkinakis is known for his amazing hair game, and gave us a little tutorial on how to do a well publicized trend, the man bun! That hair style is sure a bun, we mean fun, way to look cool and stay cool in the summer sun. With his comedic ability and infectious personality, Novak Djokovic can really put on a show. We wanted to channel that energy into an acting master class. Djokovic transforms in front of everyone’s eyes as he takes on the role of one of his faithful companions, and has a doggone fun time in the process. They say laughter is the best medicine, but champion Angelique Kerber has a few other suggestions on how to relax. The WTA star guided viewers through ways you can de-stress your life including deep breathing techniques and the power of a good hug! Jamie Murray and Bruno Soares have proved to be a fierce competitor on the tennis court, but another sport has caught their attention. The tennis duo shared their love for the sport of Padel. While they didn’t have access to a padel court, Jamie and Bruno made a makeshift court inside an English garden. “I feel like people, once they start playing, they will really enjoy it!” Soares declared. We can’t end the show without paying tribute to the Murray brothers for both ending 2016 at world number 1. Instead of sending them a card or a congratulatory Tweet, we took our support to the next level with a customized music video. Fans will get a taste of the parody video featuring an original version of Ed Sheeran’s “Don’t”.